Thank you for visiting America’s premier source for terrarium and vivarium plants and supplies since 1994! Black Jungle serves the Nature Lover within you by offering exotic, rare, and unusual plants and natural decor items from around the world. 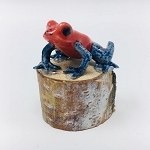 Additionally, we feature captive bred Poison Dart Frogs, true Living Jewels, to add another completely new dimension to your Living Masterpiece. And to top it all off, we offer Rainforest Adventure Tours to quench your thirst for the real thing!